We believe that leaders at all levels play a role in creating environments in which everyone can thrive. True collaboration, leadership and success are possible only when we value and embrace a full spectrum of diversity, and we have sought to put that into practice. Cisco’s Executive Leadership Team is one of the most diverse in our industry for gender and ethnicity. I am also incredibly proud that our Board of Directors is one of the most diverse as well. 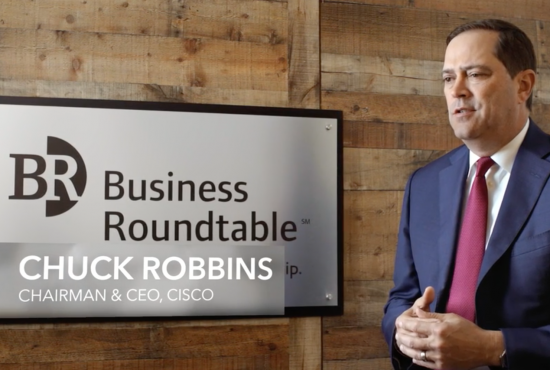 In 2017, I signed the CEO Action for Diversity & Inclusion™ pledge for Cisco, along with more than 400 CEOs from around the globe, joining forces to create fully diverse and inclusive organizations. We were also an early supporter of the UN High Commission for Human Rights Standards of Conduct for Business: Tackling Discrimination against LGBTI people. We are founding signatories of the White House Equal Pay Pledge and the Parity.org ParityPledge™ and we’re leading the charge to make fair pay a reality for all employees through the Employers for Pay Equity Consortium. To expand our longtime commitment to paying our people fairly, we developed a pay parity framework and ongoing analytics to regularly validate the fairness of our global compensation practices. Our pay parity reviews are all inclusive— testing pay equity by gender and ethnicity in the United States (as defined by the U.S. government) and gender globally. If we find gaps, we fix them. In FY2017, our analysis identified less than 1 percent of employees required a pay adjustment. In our FY2018 analysis, we identified minor gaps for 0.5 percent of employees globally — requiring less than 0.02 percent of our total global base payroll for pay adjustments. Cisco’s new Diverse Talent Accelerators solutions are helping us overcome a long-standing hiring challenge — finding diverse top talent. This suite of digital solutions helps us map the talent market, adjust our strategy to identify diverse candidates, set new aspirations and drive accountability to achieve them. Cisco’s Innovation Challenge elicited a winning idea, LifeChanger, that taps into the tremendous potential of people with disabilities and changes the way the world works. This initiative combines a cutting-edge application of our video and collaboration technologies, plus accommodations to help the disabled transcend location, mobility, and challenges to seamlessly join the workforce and contribute value. The effort has paid off, delivering more than 100 talented people who have been hired since 2016. Cisco is committed to advocating for long-term solutions that build fairness into policies, practices and laws. Our people view our company as a critical voice in the fight for fairness and equality around the globe. We take action when a situation or proposed legislation is discriminatory in our view; impacts our employees or our ability to attract and hire the best talent; or creates an obstacle to our ability to drive fairness and ensure the safety, security, dignity, respect and inclusion of our people. We believe that our most powerful stand starts with understanding the divergent opinions across our global company. We’re also committed to an ongoing dialogue. When sensitive or controversial topics arise in the workplace, we discuss them respectfully and openly. Each year, Cisco’s Networking Academies prepare more than 1 million students with the technical training and problem-solving skills they need to get a job, start a business or solve the world’s biggest challenges. Our curriculum is licensed for free to 10,400 academic institutions and other organizations in 180 countries, including numerous academies serving military service members, veterans and their families. Over the past 20 years, we’ve reached more than 7.8 million students who represent the full spectrum of diversity, and we’ve created a pipeline of talent to fuel a growing digital economy, support business growth, and help transform communities and countries around the world. Our Networking Academies have also made a commitment to benefit 10,000 people living with disabilities within the next five years. We’re executing on targeted strategies to actively engage diverse suppliers in our request for proposals (RFPs) and we require our top suppliers to bring a diverse workforce to Cisco. Our new Executive Sponsorship program pairs our top 28 diverse suppliers with Cisco executives who are committed to driving diversity, providing active coaching and new opportunities across the Cisco enterprise.